This Australian made durable mesh banner with printed graphics are an outdoor banner suitable for all types of marketing and advertising. The mesh banner is most suitable for display on fences indoor or outdoor. 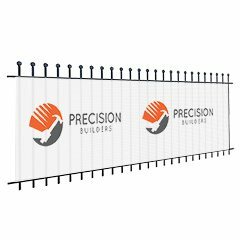 the unique feature for the mesh banner is that is has small holes throughout the banner which allows for wind and air to penetrate through he banner increasing the durability outdoors and protecting the fence structure from blowing away. All our products are manufactured locally in our Sydney warehouse to high standards. Mesh Banners are unique because they have small holes over the entire face f the mesh which allows air to penetrate. This is perfect when wrapping outdoor fences.